This figure was actually released quite awhile ago, but I didn't buy it first time around. Originally priced at $20, but is now pretty easy to find at many stores on clearance for $10 or so. 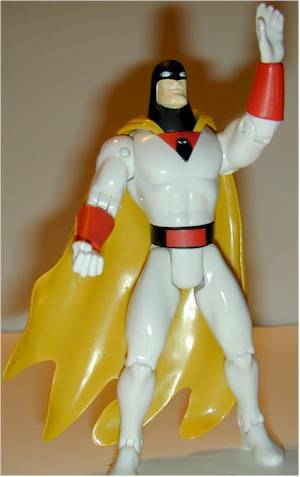 This figure is based on the popular show, Space Ghost Coast to Coast. In this cartoon, Space Ghost is the host of a late night talk show, and interviews live action guests on a big screen T.V. The figure was produced by Toycom, but Art Asylum was the driving force behind the style and design. 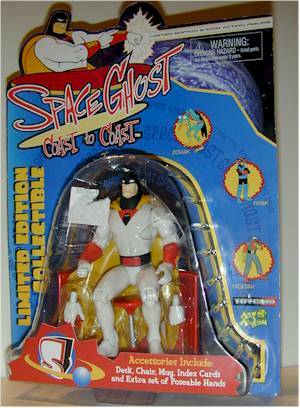 There is also a clear version of this figure, to represent the invisible Space Ghost. While it's a nice figure, it's not as nice IMHO as the properly painted version. Bright and colorful, with some great pictures of the other characters. Space Ghost is easy to see, and the bubble is inset in the cardback, making it very sturdy. Also, Art Asylum is doing something that McToys should have done 5 years ago - giving credit to the sculptors and designers of the figure right on the back of the package. Art Asylum always does a great job on their sculpting, but this figure stands out from the crowd. The overall design and sculpt is wonderful, and they've caught the look and feel of the current version of Space Ghost perfectly. DC Direct pay attention - Space Ghost has 16 excellent points of articulation, including ball jointed shoulders and an excellent neck joint design that allows his head to face forward while in a flying position. This type of work makes the 7-9 points that are the norm for DC Direct figures pale in comparison. You need to try to watch for the eyes on these though - the paint work on mine wasn't quite perfect, but when you are buying on clearance, you don't get as many choices. Excellent! 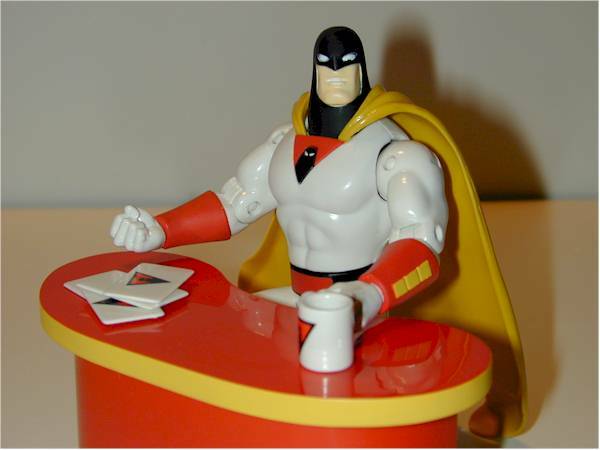 Space Ghost comes with an extra set of hands, a set of note cards (little plastic cards actually), a coffee mug and a terrific desk/chair set just like on the show. Where are the accessories with the current releases from DC Direct? Certainly nothing even close to this. At $20, the figure was pushing it. Yep, the articulation is great, and the accessories excellent, but still it wasn't bad. Now, you can find them at most comic shops and toy shows for under $15 - I picked this one up for $9.99 at an Electronics Boutique. Nothing like waiting for prices to drop to get an even more excellent value! This is a fantastic comic book super hero figure. There have been very few done this well, and this faithfully to the source material. I've not always been impressed with the work of Art Asylum, but this time around they really hit a home run. Too bad we haven't seen any of the other characters from the show produced, but at least we got the definitive Space Ghost.